Here´s one more from me, using stamps from Penny Black. What a wonderful cityscape scene, Birgit! I always love your watercolour! Thank you so much for joining our team this month at CAS Watercolour! LOVE your watercolour scene Birgit! Your card is stunning! 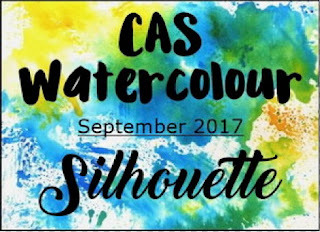 Thank you so much for being our Guest Designer this month at CAS Watercolour. Wonderful watercolouring and a beautiful scene! It's been fabulous having you as our Guest Designer at CAS Watercolour! Wonderful scene, your watercolouring is so full of feeling. Thanks for joining is at CAS Watercolour. Stunning!! Your card is just so stunning! It's really a work of art! I love this card. Thank you for sharing it.